The recent NATO summit took a decision to formally become a member of the US-led coalition fighting the Islamic State (IS), in addition to its training mission in Iraq. Last year, NATO started a training and capacity-building mission for Iraqi armed forces. In January, it opened a regional center in Kuwait. NATO AWACS aircraft operate in Syria. But the participation in combat actions against the IS has so far been limited to a few aircraft taking part in the operations of the US-led coalition of the willing. Formally, each alliance member contributes to the coalition, but NATO as its own entity does not. Despite the coalition’s efforts, the IS had grown and expanded in Syria till Russia launched its military operation there in 2015. France and Germany have always had reservations about the prospect of joining the anti-IS coalition as an alliance, concerned that it would lead to NATO taking over the fight or overshadowing regional partners, such as Jordan, Saudi Arabia and the United Arab Emirates. Italy has been skeptical of the plan. Despite all the speeches ringing alarm bells about the deadly threat coming from the IS – the mortal enemy of the West that vowed to fight it till it exists – the bloc’s combat ready forces are deploying…against Russia in the Eastern Europe! As a result, the alliance has seen no need to counter the IS plans to create a caliphate. It stubbornly turns a blind eye on the peril coming from the South. Migrant flows are flooding the territories of European alliance members, terrorist acts are committed to kill citizens of the NATO member states, US and Turkish military are fighting the extremists on the ground but the bloc largely limits itself to words of condemnation while demonizing Russia – the country which says it does not want to provoke confrontation and calls for a dialogue! The summit’s decision to join the fight comes at a time the US, UK and France-backed rebel forces based in Jordan are reported to be preparing for operations on Syrian soil. On May 18, US aircraft struck a convoy of forces affiliated with the Syrian government. The attack occurred in far southern Syria near al-Tanf, along the Syria-Iraq border – an area where US Special Operations Forces (SOF) are training local fighters. The leading NATO member plunged directly into the Syrian conflict taking sides. Evidently, the move signaled broadening of American involvement in the six-year Syrian civil war. The US has led the anti-IS in Syria since 2014, but so far has avoided engaging with Syrian government or Iran-backed forces. The US, the UK and France are the leading members of the alliance and there is little doubt they are preparing to cross the border and establish control over the region where the borders of Jordan, Syria, and Iraq meet. They will need support of other nations, especially the allied ones and it coincides with NATO’s decision to become part of the anti-IS operation. The control over the area by NATO-supported forces will include a key highway from Baghdad to Damascus that Iran has used to supply weapons to Syrian forces. Al-Tanf is a strategic crossing located at the intersection of the Jordanian, Iraq, and Syrian borders and commands the No.1 Route linking Baghdad with Damascus and the Jordanian capital of Amman. It all happens at a time NATO members involved in the combat actions and Israel are deeply concerned over the recent visit of a high-ranking Iraqi military to Damascus to discuss the situation on the Syrian-Iraqi border. The allegation that Iraq’s Prime Minister Haidar al-Abadi has pivoted his support away from the US-led campaign to the Russia-Turkey-Iran coalition adds even more fuel to the fire. Definitely, the contribution will increase. Right after the summit on May 25, the Netherlands announced the decision to send two more warplanes to fight the IS. From mid-June a Dutch KDC-10 tanker aircraft will be stationed in Kuwait. And in the last quarter of the year, a C-130 transport plane will be contributed to the fight for two months. About 90 military personnel will go with the planes. The new deployment will temporarily increase the number of Dutch soldiers in Iraq to about 175, twenty more than previously agreed. The Dutch commandos currently supporting Iraqi troops on the front will be equipped with armored vehicles and other weapons systems from next month. The Netherlands also expressed readiness to contribute several F-16 fighters from early next year. 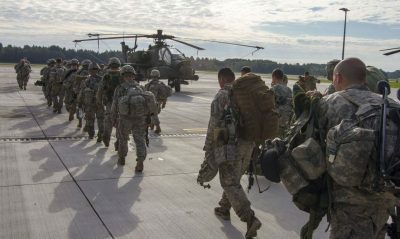 Other NATO members will increase the contribution to support the NATO effort. It will increase but it is worth to remember that the bloc’s operations in Libya and Afghanistan ended up in failure. Expanding NATO role in Syria may lead to either confrontation or coordination, or at least de-confliction, with the Russia-Syria-Iran forces. Turkey, a NATO country, is a member of Russia-Turkey-Iran trio pushing forward the Astana peace process. And the common enemy is the IS. Coordination of efforts appears to be a logical step. The issue should top the NATO-Russia Council agenda along with the plans to establish de-escalation zones. It could be discussed with Russian President Vladimir Putin during the G20 summit. Some arrangement with Russia is unavoidable. But is it an achievable goal with NATO building up its forces in the Baltics, Poland, Romania and the whole Black Sea region? Can Russia and NATO fruitfully coordinate efforts, or even cooperate, in Syria with tensions running high in Europe? Evidently, the standoff between Russia and NATO benefits no one but IS. Finding mutual understanding is indispensable to defeat the common enemy. Actually, playing off the West against Russia is the IS only hope for survival. That’s the expectation the group must be deprived of. It remains to be seen if these arguments are taken into consideration as NATO joins the fray. Peter Korzun is an expert on wars and conflicts.